Next to it was a marker for Burton C. Brownell with the same death year, 1937. I imagined that K.B. was Burton's wife and they had lived to a ripe old age, with his heart giving out soon after her passing, like stories I've heard told about other widowers who just couldn't live without their true loves. According to the Los Angeles Times, Katherine Perkins Brownell was 34-years-old when she committed suicide on June 16, 1937. The coroner determined that she inhaled ether while sitting in a bathtub of the affluent View Park (now known as Windsor Hills) neighborhood home that she shared with her husband, Burton. Burton, a petroleum engineer, reported that he and his wife quarreled over going out to dinner, he left the house and upon his return found Katherine's body and two suicide notes ~ one for him and one for the police. The contents of the notes were not revealed. On August 10, 1937, Burton, also 34, died, too. No articles explained his death, just a simple obituary listing. I'll look him up next week when I go to the Recorder's office on a research run. Whatever the cause of death I find listed, I will still believe he died from a broken heart. Rest in peace, Katherine and Burton. Which came first, the chicken or the grave? The chicken, most definitely. And not just any chicken, mind you. 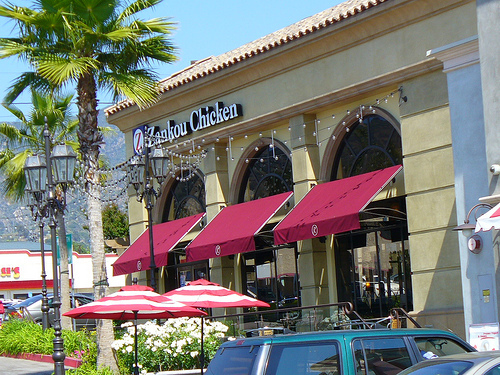 I'm talking about Zankou Chicken, the chain of popular rotisserie chicken restaurants here in Los Angeles. Zankou Chicken in Burbank, Calif.
Zankou Chicken patriarch Vartkes Iskenderian opened the original store back in 1962, in Beirut, Lebanon. The chicken was, and is, only outdone in flavor by matriarch Marguerite's top-secret recipe garlic paste. Son Mardiros carried on the tradition after the family immigrated to California, by opening the first of six restaurants in Hollywood in 1984. By all accounts, he built a well deserved fortune with the businesses and the Iskenderian family became pillars in the Los Angeles area Armenian community. So what does this have to do with grave hunting? Well, sadly, this American Dream success story took an unappetizing turn for the worst in January 2003, when shots rang out in the Glendale home where Marguerite was living with her daughter, Dzovig Marjik. Mardiros drove the short distance to his sister's house, a family fight ensued and Mardiros pulled a gun on Marguerite and Dzovig, killing them instantly, before shooting and killing himself. The story was chronicled at length in the April 2008 edition of Los Angeles magazine. 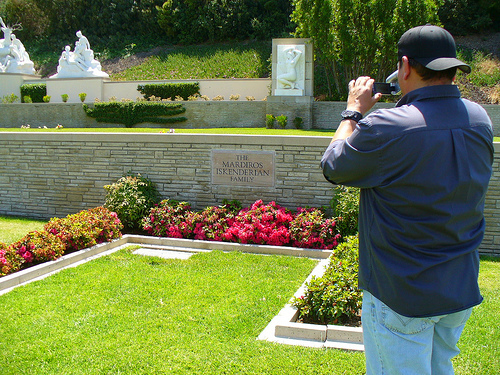 After reading the article, which mentioned that the trio were buried at Forest Lawn Hollywood Hills, my friends Louis and Steve ventured out to hunt for their graves, none of which had yet been recorded on Findagrave.com. Separate funerals had been held. Separate grave sites. Truly symbolic of a family tragically blasted apart. Afterwards, on that hot day, we headed to the Burbank Zankou Chicken for lunch and to break pita bread and reflect. The chicken was as delicious as ever, but it had a bittersweet aftertaste. As grave hunters, sometimes the only thing you can do besides recording the names, legends and photos of the resulting headstones for history's sake, is to ease back into the the world outside of cemetery gates where, for instance, we can join legions of loyal Zankou Chicken patrons in doing our part to keep what's left of the Iskenderian's business legacy alive. For specifics on the locations of the Zankou Chicken family graves, and to pay virtual respects, visit Findagrave.com.